Green Curtains help combat climate change by reducing office temperatures and energy use, encourage employee involvement in environmental efforts and can add an interesting harvest to the employee cafeteria! Abnormal weather such as heavy rainstorms and droughts in recent years has raised awareness of the need to combat climate change today. Local efforts are vital in addressing this and reducing CO 2 emissions. Based on the longstanding philosophy of “harmonious coexistence” and a commitment to social responsibility, Kyocera shares the global task of using limited energy resources more effectively — with each individual office worldwide voluntarily creating their own environmental goals for ongoing improvement. In Fiscal Year 2015 (April 2014 to March 2015), the Kyocera Group’s energy consumption basic unit *1 was reduced by approximately 6.6% compared with the previous fiscal year through measures such as installing solar power generating systems, introducing high-efficiency equipment, utilizing exhaust heat and improving product transportation. Another energy-saving effort includes growing “Green Curtains” at its sites, which Kyocera began in 2007 at one of its manufacturing plants in Japan. Since then, the activity has been expanded to 34 sites in Japan and affiliates overseas including China and Thailand. 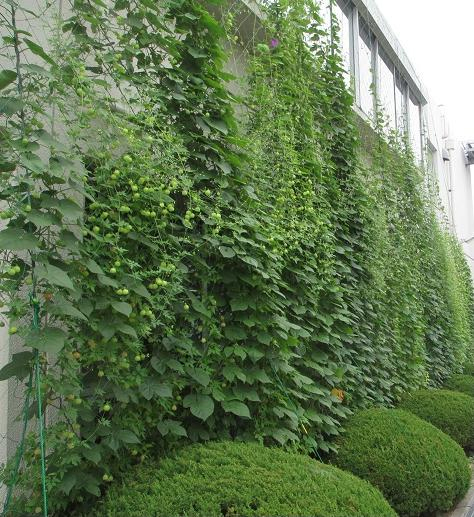 In 2014, Kyocera’s Green Curtains stretched a length of roughly 1,053 meters (approx. 3,454 feet) and an area of 4,314 square meters (approx. 46,436 square feet)— equivalent to the area of 16.5 tennis courts. Throughout their annual growth cycle, they are expected to absorb 15,000kg (approx. 16.5 tons) of carbon dioxide *2 , or roughly the same amount as 1,070 cedar trees *3 . What is a Green Curtain? 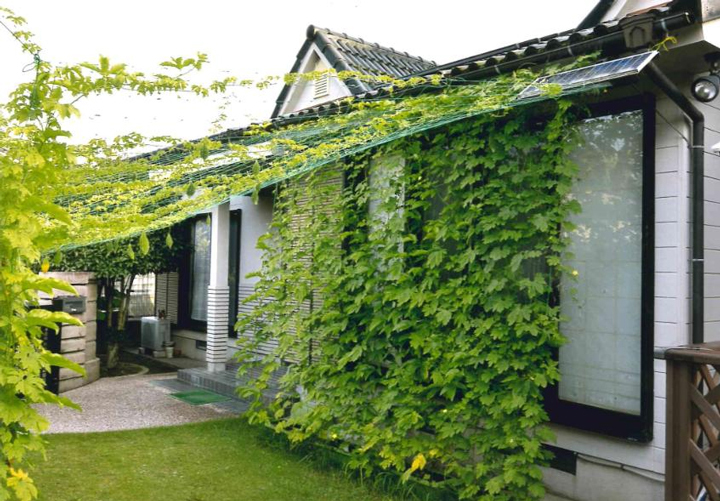 A Green Curtain is natural shade over the outside of a building window created by growing climbing plants such as gourd or morning glory. By blocking out the intense, direct rays of the sun, they help to reduce the temperature inside rooms and on the surface of buildings. The indoor temperature is also cooled through the transpirational effect of water evaporation from the leaves, which enables businesses to reduce their energy consumption by minimizing air conditioner use and thus reducing CO 2 emissions. Strong sunlight shining directly through windows raises the room temperature inside of buildings. Furthermore, temperature rise of the ground or exterior walls near a window will also contribute to a rise of room temperature, and that radiant heat gets transferred to the human body. As a result, people inside feel hotter than the actual room temperature. The foliage of the Green Curtains blocks out direct sunlight and reduces the amount of heat radiating into a room. In addition, by extending the growth of Green Curtains to cover the ground and walls in the proximity of windows, Green Curtains further help to prevent the rise in surface temperature of buildings, and thus decrease room temperature and the heat level that people inside actually experience. 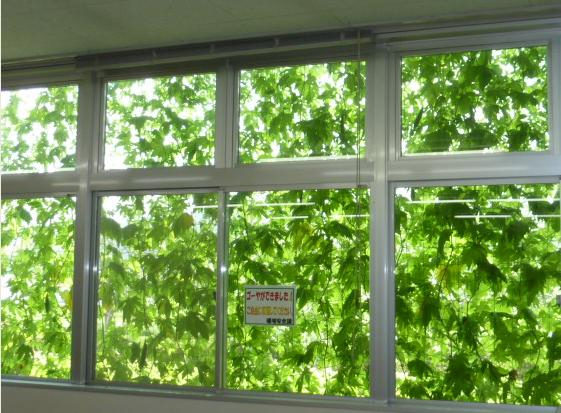 Moreover, Green Curtains mitigate temperature rises through the transpiration effect. The transpiration effect works by drawing in heat when water absorbed by a plant is evaporated from its leaves. People inside buildings feel cooler due to the decrease in radiant heat penetrating into a room. Therefore, the transpirational effect of Green Curtains helps create a cooler atmosphere than use of traditional window blinds. 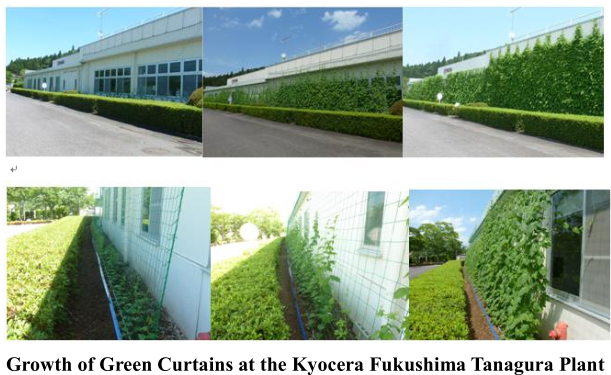 By performing an infrared thermographic measurement at its Kagoshima Sendai Plant, Kyocera has confirmed that Green Curtains are effective in preventing the rise in temperature of outer walls. 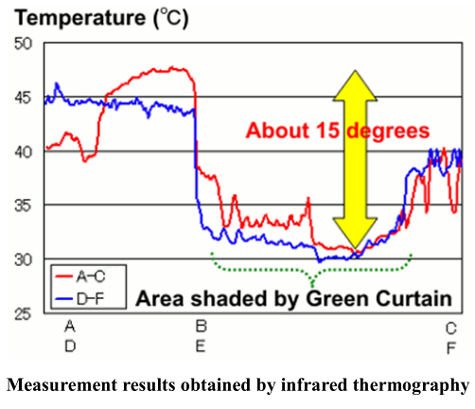 A comparison in temperatures of the wall shaded by the Green Curtain and non-shielded areas nearby indicated that Green Curtains can decrease the surface temperature of the outer wall by as much as 15°C (27° F), as shown in the graph of surface temperature between A-B-C and D-E-F.
Kyocera has taken the lead in this environmental initiative creating a step-by-step instructions for making Green Curtains flourish at the workplace or at home. 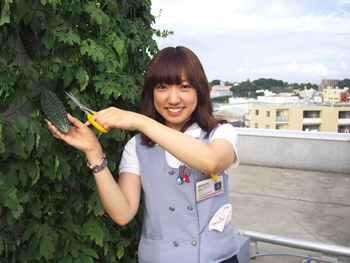 At several company sites in Japan, Kyocera also offers the seedlings produced by the Green Curtains to people in the community; and employees are encouraged to “green their homes” as well, with annual photo contests, awarding those who grew the most excellent Green Curtains. 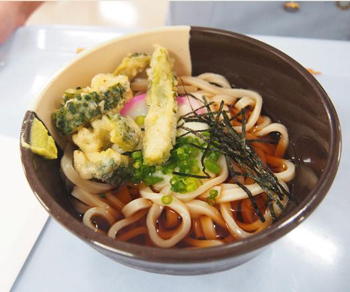 Employees also harvest some of the vegetables produced by the Green Curtains, turning them into delicious ingredients in special dishes served in the employee cafeterias. Along with morning glory and goya (a traditional vegetable of the southern Okinawa Prefecture in Japan commonly known as bitter gourd), Kyocera cultivates cucumbers and peas as Green Curtains at its sites. Moreover, the nutrient-rich bitter gourd helps prevent fatigue in the hot season. *1 The energy consumption basic unit is an index for efficiency of energy use and represents the amount of energy use per production value.